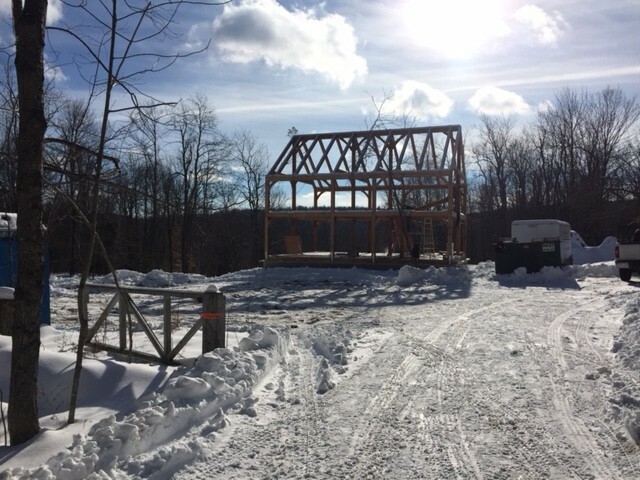 The snow melted and the timber frame crew jumped to work. The entire frame was hand cut off site by Hardwick Post and Beam. 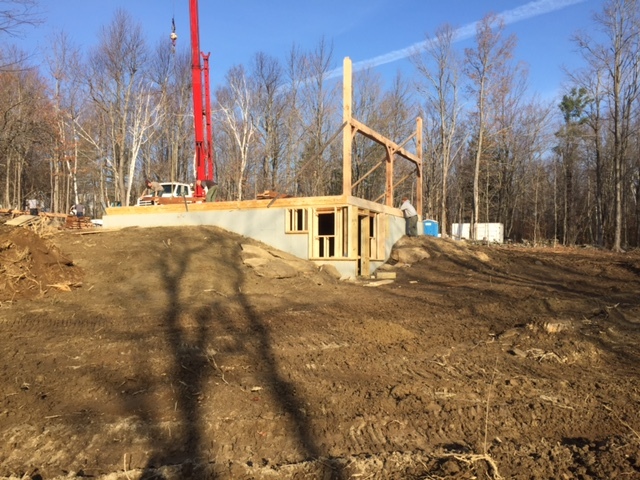 The crew worked quickly and raised the frame in less than a week. Here the first of four bents, or sections of framing, has been raised and braced into place. Each bent is carefully assembled on the floor deck and then raised up by the crane. The first floor bents have been assembled and raised and the second floor deck filled in. The ridge has been set and the second floor sections of each bent will be constructed in place. Each timber weighs hundreds of pounds and must be lifted in place with the crane. 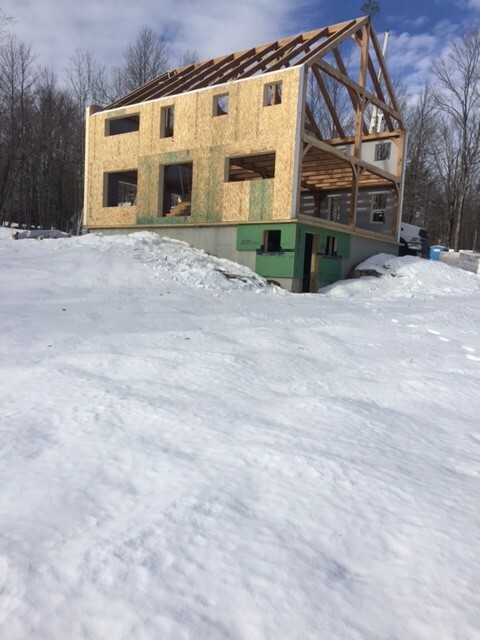 With the final rafter set in place, the timber frame is complete. The guys at Hardwick Post and Beam have set the traditional pine tree at the ridge to honor the centuries old tradition of timber framing. After having them on our job site and seeing their work, I can attest to just how well they embody that tradition. The Beattys elected to go with oak timbers covered with a light stain. 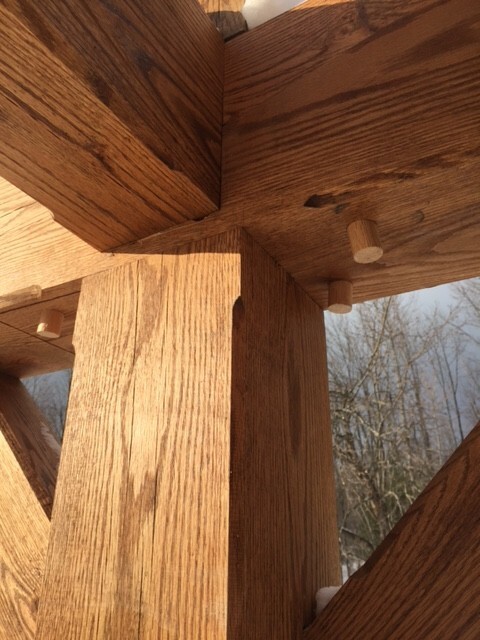 The crew at Hardwick likes to leave the timber pegs cut long as a signature detail of their work, a reminder that this is a house built very much by hand, many hands for sure, hands fueled by a passion for craft. Mother Nature gave us a break, but only a short one. Close to a foot of snow fell in Savoy while we waited for the SIP panels. 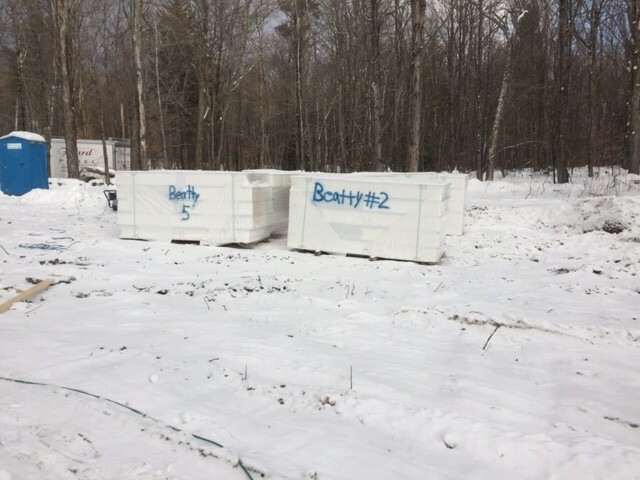 The SIP panels sit in the snow. SIPs are structural insulated panels. They are a sandwich made up of two sheets of composite wood material with expanded polystyrene foam (think coffee cup) in between. 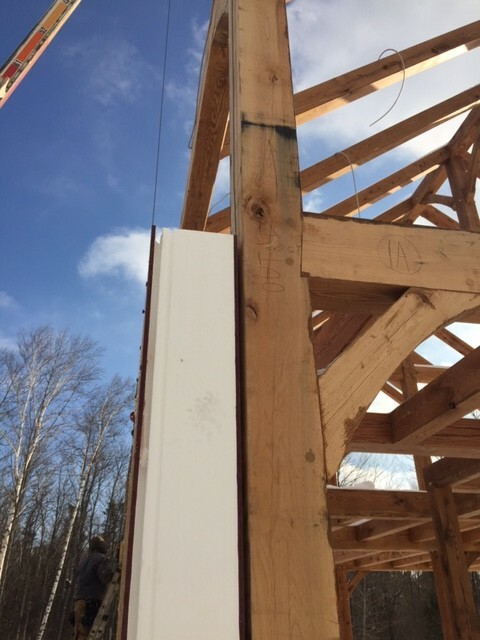 The entire timber frame gets wrapped in these panels, which are pre-cut off site and lifted into place by a crane. The wall panels are 10” thick giving the walls an R-value of 38. The roof panels are 12 thick giving the roof and even higher R-value. Foard Panel out of West Chesterfield, NH fabricated and installed the panels. 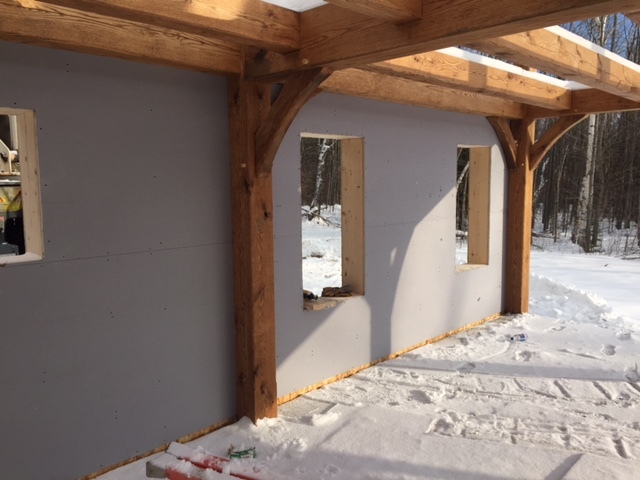 The gap that you can see here leaves room for the interior sheetrock, which is sandwiched between the timber frame and the panels. This space also provides room for some electrical wiring. 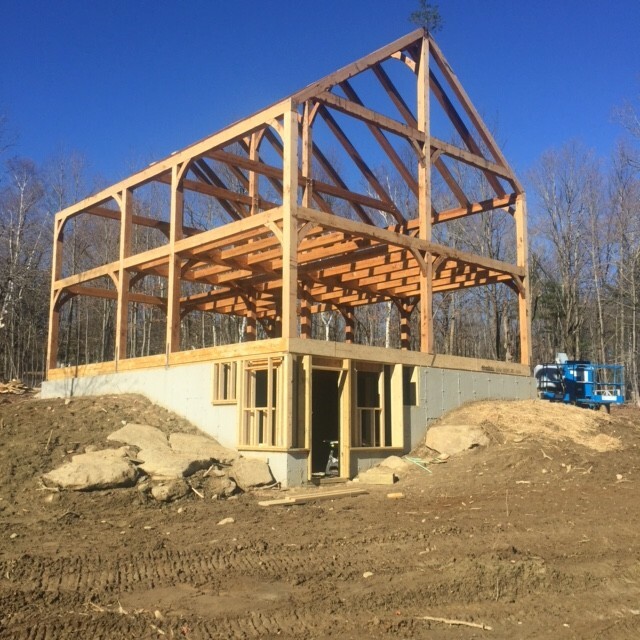 By placing the SIPs entirely outside of the timber frame structure, we leave the beauty of the timbers fully exposed. It makes for quite a dramatic look. All the rough openings for the windows and the doors are pre-cut into the SIPs. 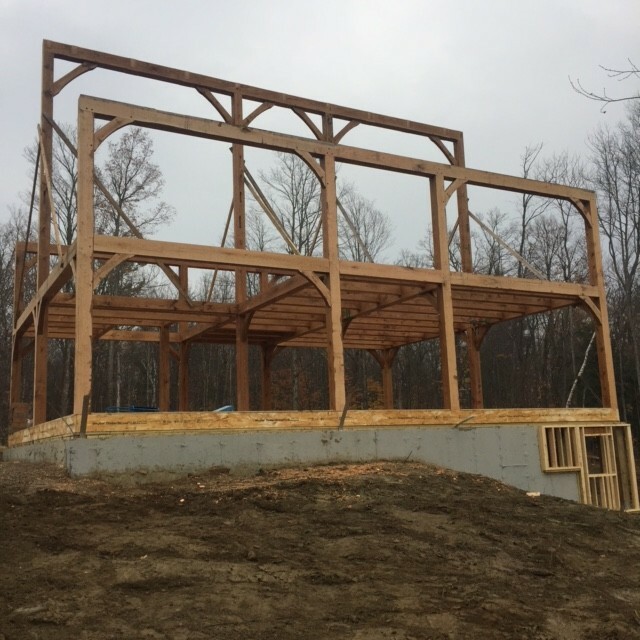 Since the SIPs entirely wrap the frame, they provide for an excellent and reliably achieved air barrier around the entire structure. This gives us the air tightness that is so essential for any high performing, energy efficient structure. A typical residence suffers more than 40% of its heat loss through air leakage. A properly detailed SIP house will typically be 7-10 times tighter than a house built to the standards set by recent building codes.